Ref: This Ministry's letter of even number dated 07.07.2017. Please refer to Railway Board's letter of even number dated 07.07.2017 enhancing the monthly honorarium for Ayurvedic/Homeopathic Consultants and monthly subsidy on medicines on the Ayurvedic/Homeopathic dispensaries being run by the Staff Benefit Fund Committees. 3. Annual allotment for "Indigenous System of Medicine" under SBF (under which Homeopathic and Ayurvedic dispensaries function) at Rs.36 per capita, if found inadequate to meet the increase in requirement of funds on account of the above revision in the honorarium, the additional expenditure (necessitated due to revision) under these orders would also be met through re-appropriation from the head "Medical Services" as additional ad hoc contribution to the SBF, and, accordingly, the Medical Budget would be suitably augmented from Revenues. Hence PCPOs would advise CMDs about the additional funds required on this account so that the same could be reflected in the budgetary estimates. 4. The aforsaid revision will take effect from 07.07.2017. This issues in consultation with the Health Directorate and with the concurrence of Finance Directorate of the Ministry of Railway. 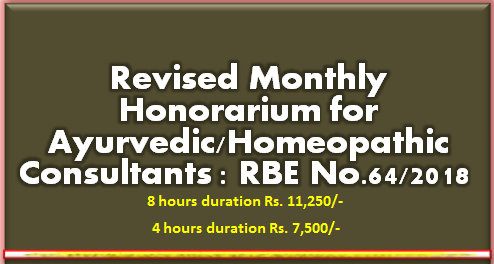 Railway Board has enhanced the rate of monthly honorarium for Ayurvedic/Homeopathic Consultants under Staff Benefit Fund. The enhanced rate of honorarium is Rs. 11,250 for 8 hours duration and Rs.7,500 for 4 hours duration.